Point B: “Wait, Christmas is next week? No, no, no, you must be mistaken. It can’t be Christmas yet because I have literally zero presents prepared. How does this keep happening?” every holiday season? The holiday season is a creeper; it lurks, it crawls, and before you know it — it’s knocking at your front door with a casserole and tree decorations. So, my suggestion? Whip out those Amazon wish lists and start filling up your cart with goodies for the festive season now. Welcome to my blog post, you totally-responsible-and-diligent-planner. You’re already ahead of the curve - congrats! Doesn’t matter which one of the two you are, you’ve come to the right place. Who certified these products as ‘Entrepreneur-Loved,’ you ask? Me and my fellow entrepreneur friends! As an entrepreneur myself, I’ve tried and tested all the best home office essentials, the tech must-haves, and the GSD productivity tools. So whether you're looking for the perfect gift for the entrepreneur in your life or you really just want to spoil yourself — here’s the ultimate holiday gift guide for the entrepreneur, freelancer or business owner. Start 2019 ahead of the pack. Help the entrepreneur in your life get their business goals down on paper so that they can crush them in the New Year. Give the entrepreneur in your life the gift of productivity. The Five-Minute Journal will help boost focus, clear out the mind’s clutter and keep everything running to plan. It’s the easiest way to kickstart 2019, feeling more mindful and living life with meaningful intention. The best part is all of this can be achieved while sipping on a warm cup of morning coffee wrapped in a soft blanket. So picturesque, right? Click HERE to shop the Five-Minute Journal. Is your mom, best friend or co-worker thinking about starting a side hustle in 2019? Slip this journal into their Christmas stocking. Conquer Your Year is an entrepreneur planner made by the award-winning business owner, Natalie MacNeil. Its pages will prompt you to outline actionable baby steps to help you achieve your long-term goals. The tasks are broken down quarterly, monthly, weekly, and daily, making it easy to cross that finish line by the time the year ends. I also love that the book encourages you to set a "word of the year." I know it seems like a simple idea, but setting intention helps to align the focus of your business and goals. Click HERE to shop Conquer Your Fear. The right book can take you and your career places you could’ve never imagined. If someone in your life needs some motivation with their hustle, give them the gift of curling up with some of the best minds in the business. Life as an entrepreneur isn’t all that glamorous. Sometimes you’re plagued by feelings of doubt that just stop you from moving forward. Then Jen Sincero has all the answers to snap them out of their funk. In the book’s 27 chapters, she discusses how to get rid of self-sabotaging beliefs and behaviors, and map out how to reach those big business goals. It's an excellent book for someone graduating from college, starting a business or struggling with second-guessing themselves. BONUS: This book is also available on Audible – so there's no excuse! Click HERE to shop You Are A Badass. Ever wondered how millionaires make their money? Multiple income streams. Help that someone special in your life unlock that door of financial freedom. Entrepreneurial You is full of easy and practical ways to increase your income stream from all kinds of sources. It's a great gift for anyone starting their business in 2019, or a busy parent who wants to kick off a side hustle in the New Year. Click HERE to shop Entrepreneurial You. There is never a dull moment as an entrepreneur. You're always wearing a different hat, and because of that, you need the right tools to help your business actually move forward. Here are some of my favorite gifts for business owners that will make managing their personal and professional life a little easier. Did you know that looking down at your devices is like having an eight-year-old stand on your head? I’ll give you a minute to process that because it sure took me quite a few minutes to process that. If that doesn’t convince you that you need to get a phone stand for the entrepreneur in your life that you love, I don’t know what will. This phone stand is a cheap, practical and health-conscious gift to get a busy entrepreneur. I love using mine for Skype or WhatsApp calls, or to avoid putting strain on my spine. It's also a great organization tool that will keep your desk clutter-free. Final special bonus: this stand is compatible with most tablets and eBook readers as well! Click HERE to shop the Omoton Phone Stand. As a traveling entrepreneur, my Wi-Fi Signal Booster is a life saver. Gone are the days where spotty or bad signal killed my productivity for the entire day. The Nano Travel Router fits right into your pocket, creates a secure WiFi hotspot and boasts a 300 Mbps Wi-Fi speed. It's by far one of the best gifts for traveling business owners! Click HERE to shop the Nano Portable Wi-Fi Signal Booster. This one’s just a little bit of fun for the entrepreneur in your life. When HP released their Sprocket Portable Photo Printer, I knew I needed it in my life. It's a compact photo printer that's small enough to fit into your bag and lets you print all of your favorite social images straight from your smartphone. While traveling, I've used it to print fun moments from my trip, as well as to share photos with the people I'm with. While I could just WhatsApp some shots, there's something incredibly nostalgic about having a tangible memory physically in your hand. Click HERE to shop the Sprocket Portable Photo Printer. Click HERE to shop the Blue Yeti Microphone. 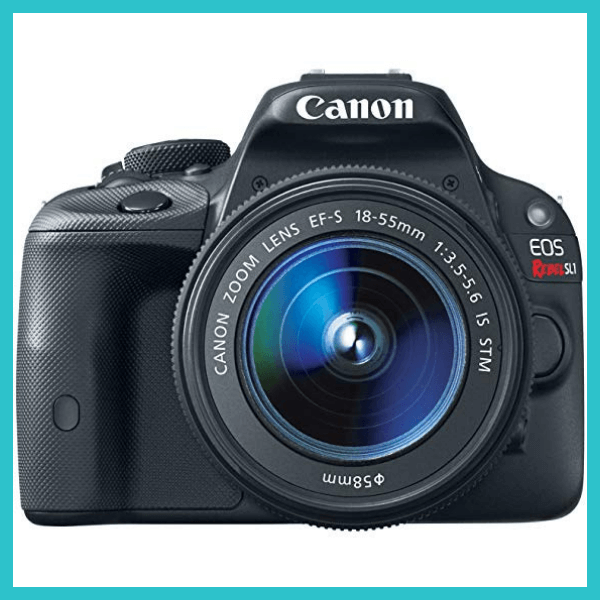 Click HERE to shop the Canon EOS Rebel DSLR. Click HERE to shop the Apple Macbook Pro. Encourage the entrepreneur in your life to keep their goals and tasks where they can see them with this beautiful monthly calendar by Kate and Laurel Calter. It’s a stylish home office gift for any busy entrepreneur. Plus, it has more than enough space to pencil in appointments, reminders and to-do lists. The board also comes with black magnets to help pin up photos, fliers and anything else that needs to be kept front and center. Click HERE to shop the Magnetic Monthly Calendar by Kate and Laurel Calter. What do you get the entrepreneur who has everything? A decorative hanging planter, of course! Having a beautiful home office helps to set the tone for the whole day. Contemporary, elegant designs like these hanging planters will take any space to that next level. It's the perfect way to add some nature. Plus, there are studies that have shown office plants can boost productivity, so it’s a two-in-one present really! Click HERE to shop this Decorative Hanging Planter. Humanity, as a race, runs on coffee. I'm sure of it. I don't know where I'd be without my warm cup of joe in the morning to get me in the right headspace to crush all my tasks. If you feel the same way, you know the importance of a good coffee machine, but also how time-consuming it can be to have a (teeny, tiny) caffeine addiction. Help a busy business owner save time with the Keurig coffee maker. It allows them to brew up to four cups of coffee before they have to refill - simplifying their morning routine. Plus you can control the strength of the coffee with a simple press of a button. Click HERE to shop the Keurig Coffee Maker. Click HERE to shop the Alera Swivel Chair. 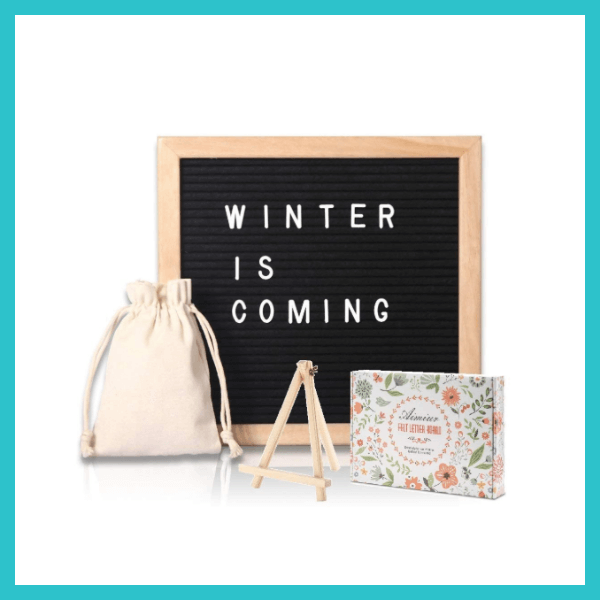 Click HERE to shop this Felt Letter Board. Click HERE to shop this Wood Block Calendar. There are all kinds of subscriptions that can help an entrepreneur run their online business smoothly (and even boost their bottom line). The best thing about Teachable is that anyone can upload a course and start making an income. Know someone that has a ton of knowledge about digital marketing or speaks a few languages? Encourage them to share their wisdom with the world! ConvertKit is the best email marketing tool out there. I've used ConvertKit since I first launched my personal brand business, and it has helped me increase sales for all my online courses and digital nomad retreats. You're never too old to learn something new. If you have someone in your life always talking about how they’d love to do a social media course or learn the principles of SEO, treat them to a few courses on Skillshare. The gift of learning just keeps giving! You need even more gift ideas? I’ve got you for every. single. awesome entrepreneur in your life, AND for any holiday and every holiday you are celebrating this year. Check out all of my gift ideas to ensure you’re crowned the Best Gift Giver™ by family and friends this holiday season.